YES Grow MY Dental Practice! All Of Our Dental Websites Are Mobile Friendly And Mobile Optimized. We Also Create All Our Websites As Lead Generation Properties That Are Guaranteed To Not Only Capture The Traffic Going To Your Site But Convert That Traffic Into Paying Long Term Customers. 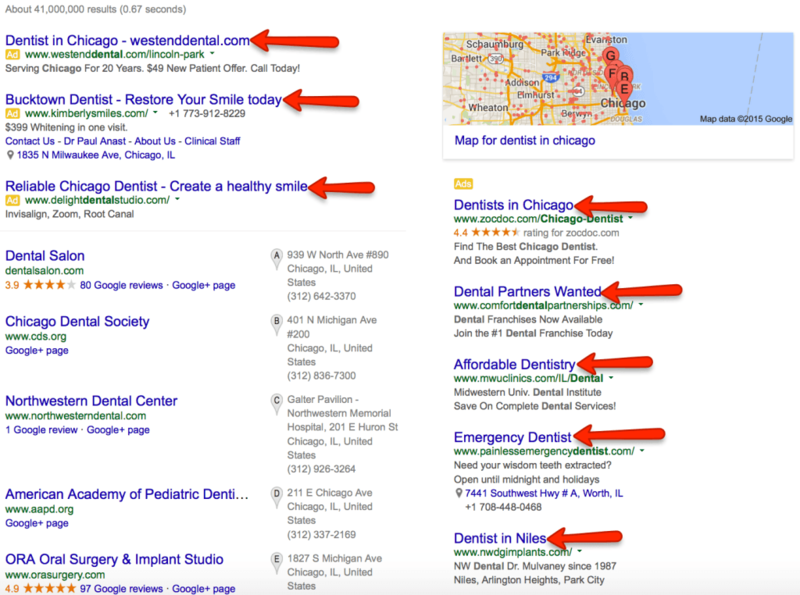 We Don't Just Do Dental SEO Marketing, We Own The Dentist SEO Marketing. When Most SEO Companies Spend Their Time Working In Other Niches We Stay Focused And That's Why We Are The #1 Dental Marketing Company In America. Work With A Company That Knows. Are You Looking To Make A Big Splash On Facebook Or Other Social Media Platforms? Then We Have The Targeting And The Ads That Produce. We Have Spent Hundreds Of Thousands Of Dollars with Over Ten Years Marketing For Dentists On Social Media. Having a strong online presence with video is one of the best advantages of digital marketing. Video marketing for dental practices have been proven to show significant results in dental brand awareness. You cannot get a more targeted form of advertising than placing an ad directly in front of someone that has proactively searched for a specific (dental) treatment or service. Talk to one of our Pay Per Click Dental Experts. Social Media Marketing is word of mouth marketing at its core. The tricky part is executing and creating the "BUZZ" that drives it. Quality content is essential in gaining a following and producing quality customers. Why Use Complete Dental Marketing? Dental Is All We Do! Our Company Has Been Established And Working With Dental Clinics Since 1999 We Are Not Like Other Marketing Companies That Put There Focus All Over The Place Trying To Rank Every Plumber, Electrician Or Restaurant. We Have Spent Years Establishing Our Targeting and Marketing For Dental Offices Just Like Yours. Don't Get Sucked Down The Rabbit Hole WIth Other SEO Companies That Promise You The World But Put There Focus In Other Things Besides Dental We Are Here To Provide The Results You Are Looking For. 88% of people trust online reviews, So if you show up next to a competitor on google your online reviews could end up being the deciding factor. Let's get back into the driver seat and generate more reviews and boost your search engine rankings. The social media networks present an extraordinary marketing opportunity for dentist who are looking to promote their practices. Potential patients are increasingly embracing social networks as an integral part of their everyday lives, don't miss the boat. Every Dentist knows the importance of local search rankings so why aren't you tracking it everyday and expanding on your organic territory? We are here to help you own your local market while gaining more and more untapped keywords and territories before your competition does. Complete Dental Marketing Has Been A Blessing To Me And My Dental Practice, We Have Been Utilizing Their Marketing Team For About 4 years Now And Every Year They Continue To Surprise Us With New Innovative Techniques. Let's start communicating! Send us a message with any questions or comments you have and our support team will respond back within 24 hours or less. Lets meet up! Schedule an appointment to meet us in person at our offices, at your practice, or for an online consultation with one of our expert dental marketers. Let's Talk! Get in touch with a sales specialist via phone for a one on one conversation. We are available and really excited to answer all of your questions. Email provides a fast, affordable, easy way to improve your dental practice. It’s the one piece of technology that everyone uses, with over 200 billion emails sent each day. Study after study have shown that the fewer choices you give people when they come to your website, the more likely they are to respond to you. All Of Our Practices Are Hippa Compliant So You Can Rest Assure That We Have Your Best Interest At Hand. If You Looking For A Hippa Compliant Marketing Company Here We Are. There Is No Surprise To Know That Dental Marketing Is In our Blood. We Eat, Sleep and Breathe it. Since Our Dental Marketing Firm Opened In 1999 We Have Been Working On Marketing Dental Products And Dental Practices For Over 18 Years. Our Expert Knowledge Within This Niche Community Has Given Us An Unmatched Insight Into The World Of Dentistry And The Minds Of Dentist, Hygienist and Dental Patients Therefore We Bring You This Brand New Results Driven Dental Marketing Training Course! Get instant access to our private facebook group where you will be able to converse with our entire Dental Marketing Team and other Dentist and Dental managers just like yourself. If something new is working you will be the first to know and be able to implement for your dental practice. If you have been looking for a training course for your dental practice then you have came to the right place with over 18 years marketing for dental clinics in the united states we have gained an exuberant amount of knowledge and demographics that no other dental marketing company has. We have spent the last 2 years building a training course that we can stake our reputation on. Marketing is important for all our businesses, and it's no different for dental offices. From gaining exposure, if just starting out, or wanting to gain more customers, to retaining current customers by sending offers or giving helpful tips, marketing is crucial. However, because of the scarce timing and lack of experience in marketing and SEO, many dental offices need assistance with dental marketing. Doing SEO for Dentists is not rocket science.. It does however take expertise to coordinate the planning and fine tuning of your site to give all of your visitors a great experience. Repetition- up to 80% of new patients will be brought in when using repetition. 80% of sales will occur by the fifth contact or later, according to market research. Also, dental offices must do marketing repeatedly and consistently, so the prospective patient will know who to call when needing a dentist. And besides, constantly reaching out to customers/prospective customers will show that these dentists care which is greatly appreciated by many consumers. Geo-targeting ads- an 81% of response are boosted when geo-targeted online ads are added. This could be done through social media, direct mail, and pay per click. With this, dental offices can get more exposure and reach out to the local market. Trust elements- 72% of additional business is added with creating the trust elements. This is done by using methods to ease the nervousness of people going to the dentist, thus the term "trust elements". Dental offices can show photos of the staff and the dentists, include a brief bio about the dentists and display testimonials, ratings, and reviews from very satisfied patients. Valuable offers- because some people don't have access to dental insurance, many of them will appreciate and work with a discount, like 20%. Many dental offices also attract more customers when they show that they have an affordable payment plan, have a sliding scale, and/or have financial assistance available. ​When it comes to the site's design, dental offices should first start with a complimentary review of the current site and receive tips for improvements. Just like the packaging of any product, the web design is very important in attracting the consumer's eyes, easy and convenient accessibility, viable information, and more. Once a complimentary review and tips are received, these dental offices could hire an expert in web design to discuss what they need. An experienced and reputable web designer will know how to handle any of our businesses branding and marketing services, including marketing collateral, logo design, custom advertisements, and targeted direct mail campaigns. ​Dental offices must use SEO to get a high rank in the search engines. Keywords, keyword phrases, and the density level must be taken into consideration when it comes to SEO just like any business. However, important keywords for dentists should be considered. And if dental offices don't have time for SEO, then experts specializing in SEO should be hired. Our dental SEO company staff will help you to get your name out there and in front of new patients using the power of search engines. Contact us today to learn more about how we can help improve your SEO efforts! ​Other great tools include the dental ads, videos, and email blast. Print advertising is affordable and effective as it always has been. Yellow pages, newspapers, flyers, and magazines are normally used for print advertising. And when it comes to online advertising, it can be effectively done through social media, pinpoint marketing, and so forth. Email marketing is also part of online advertising. Marketing videos for dental offices are a great way to connect with your patients and prospective patients. With these videos, you will retain patients by building relationships. These videos are also good at restoring relationships with patients who haven't visited in a while. And of course, marketing videos will help our businesses rank higher than the competition. It's been proven for a long time that email marketing is very effective. Whether it's staying connected with current patients and reaching out to prospective patients, email marketing is the way to go. Dental offices will show how they care for their patients by sending reminders, viable information to keep the patients and their loved ones' teeth and gums healthy, provide valuable offers for new and recurring patients, and so forth. Social media has majorly expanded the reach of word-of-mouth advertising in today's world. It used to be that patients would recommend you to a few close friends, however, today’s experiences are shared with hundreds if not thousands at a time. Social media platforms allow practices to control the conversation by addressing concerns and questions while building trust in the process. Social media is the arena perfect for allowing your practice to cultivate brand equity and credibility, but it requires attention and nurturing. C.D.M offers authentic social media management service specifically for dental practices. Our social media management allows you to have a customized social media program with unique and engaging content that we make specifically for your dental practice. We manage, setup and regularly post to your social media platforms on your practices behalf. If you are a dental practice that wants to be more involved and grow your followers to spread the news of your dental practice, we will work with you to implement strategies designed just for you. Social media management is important in order for your practice to stay in front of your patients. It retains existing patients while getting referrals for new ones. Effective marketing strategies include email marketing, dental ads, dental videos, dental SEO, social media managing and so much more. Strategically applying these marketing techniques in the business marketing campaign and budget, dental offices are bound to have great success. And upon constantly providing great services, they can continue to maintain and grow their customer base. There are some worthwhile strategies to use with dental marketing regardless if dental offices have enough time or not. Stop worry about precious time you could be using to help your patients and let us take the reigns. Hiring our team of marketing experts will allows us to assist with the details associated with marketing and growing your business in any and every way possible. Copyright © 1999-2018 Complete Dental Marketing Inc.